In this post to his site Martin Hujer suggests that you don't use entities directly in your Symfony forms, opting instead for custom functionality to persist form data. And I don't think it is a good idea! Why? [Three reasons:] an entity should be always valid, change [in the future and] layers separation. For each of these downfalls he gets into a bit of detail about what the issue is and introduces the alternative: a custom data class. This class is then used to represent the data in the form with some simple assertions. He includes an example of this kind of class with three properties: title, content and public date. He then shows how to build a form using this class and how to handle updates, not just creates, with the same functionality. Michael Dyrynda has written up a new post for the Laravel users out there showing an elegant form handling method he's come up with that doesn't involve the use of the older version of the Laravel Collective HTML package. On episode 28 of the North Meets South Web Podcast, Jake and I were discussing packages that we always pull into our Laravel projects. Jacob mentioned that he still uses the Laravel Collective HTML package, which was forked from the functionality that was present before Laravel 5, which is something I suggested I hadn't done for a long time. [...] Jacob went on to explain that a big part of using the form package is because it handles binding form data directly to the forms for you, allowing you to separate form inputs from the create / edit components themselves. [...] I suggested that you can go about this simply enough in your applications by using a combination of the old() helper method and an empty model. He includes code examples of both ways to generate the form, first using the Collective package then using just the old() helper function to repopulate the form values when the page is rendered. He points out that using this internal method doesn't require yet another package. There are some niceties that are missed with going with the old() method, but there are benefits too. In a new post to his site Matthias Noback introduces you to a package that can help you in your Symfony-based console application, combining the Form and Console components, to make it easier to create "forms" on the CLI. About 2 years ago I created a package that combines the power of two famous Symfony components: the Form component and the Console component. 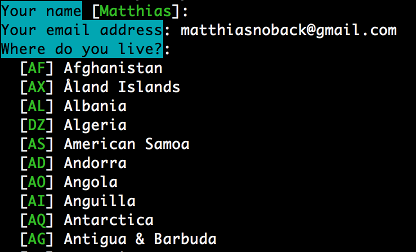 In short: this package allows you to interactively fill in a form by typing in the answers at the CLI. When I started working on it, this seemed like a pretty far-fetched idea. However, it made a lot of sense to me in terms of a the package in use, building a "form" that just asks the user to input a name. An image of the result is included as well. He ends the post with some of his other general findings during the process of creating the package and suggests a few common use cases including installation wizards that can be used in both the CLI and web interfaces.